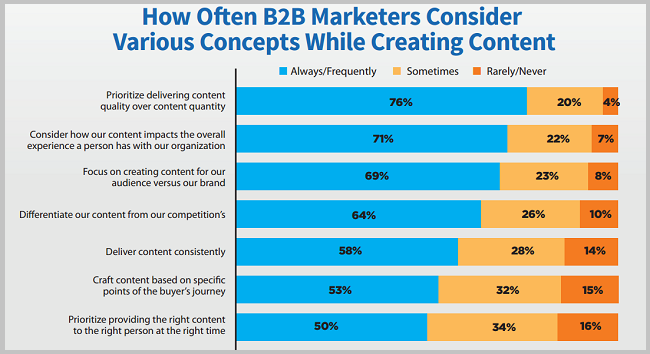 If you’re a B2B content marketer, you likely remember where you were when the Content Marketing Institute and MarketingProfs released last year’s B2B Content Marketing report. The same way different generations will always remember hearing about Elvis, Kurt Cobain, or Prince, that dark day is seared into our industry’s memory. Last year’s report showed a decrease in documented content marketing strategy—even though a documented strategy was proven to be a vital part of success. 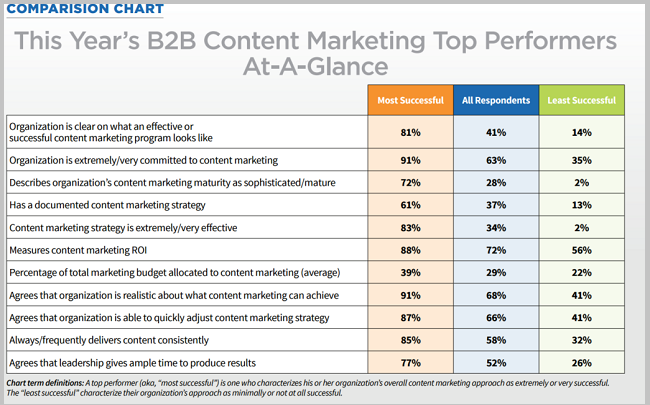 It showed that fewer content marketers rated their efforts as effective than the previous year. At Content Marketing World, Joe Pulizzi somberly declared content marketing had reached the “trough of disillusionment,” out of which we would have to climb. Secluded in her tiny writing house, Ann Handley paused for a moment to wipe tears from her trademark glasses. 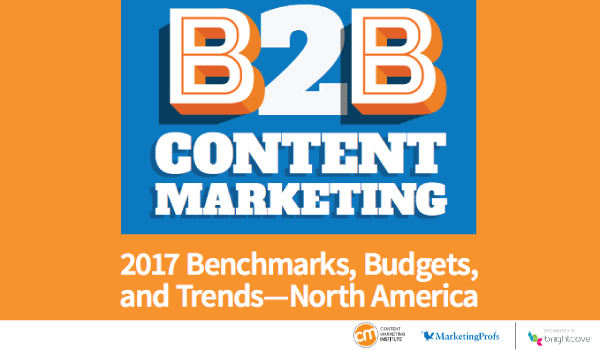 Fortunately, this year’s report—The 2017 B2B Content Marketing Benchmarks, Budgets and Trends—shows that by and large, we’re moving onward and forward to content marketing success. Sixty-two percent of respondents report they are much more or somewhat more successful with their content marketing now than a year ago. It’s good to know that, as an industry, we’re not letting Joe and Ann down anymore. And, of course, good to know we are on the way to better results and more effective content. The rest of the report has valuable insight for everything from content creation to amplification channels. 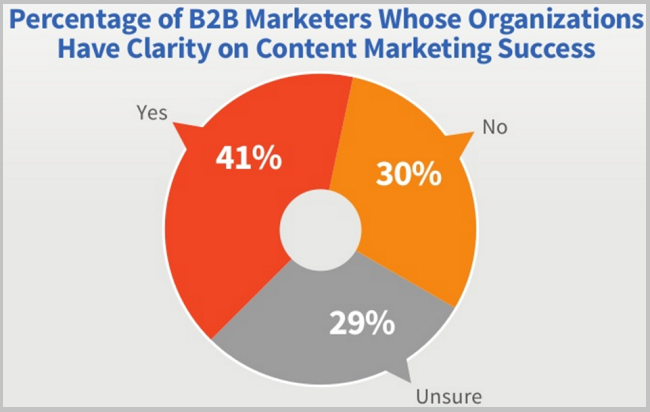 But this chart by itself is a blueprint to making your organization a content marketing champion. Let’s take a look at these characteristics of top performing B2B content marketers and the practical steps you can take to go forth and do likewise. 81% of top performers say their organization is clear on what an effective content marketing program looks like, compared to only 41% of all respondents, and 14% of the least successful. It makes sense that such clarity would lead to better performance. How can you pursue success if you don’t know what it looks like? Another important aspect of knowing what success looks like is having a realistic outlook on what is possible. 91% of top performers say they are realistic about what content marketing can achieve, compared to less than half of the least successful respondents. How to Do It: See what content marketing can do by exploring industry success stories. See how the top performers are achieving their goals. From there, you can see how to adapt what works to your specific industry and audience. Then channel that overall picture of success into a specific plan with reasonable goals and metrics to measure. At Content Marketing World this year, Joe said it was time for organizations to go “all in” on content marketing. This stat supports his plea: 91% of the most successful are extremely or very committed, compared to 63% overall and only 35% of the least successful. The commitment aspect is important because content marketing works far better as a marathon, not a sprint. It’s an ongoing process that takes time to build a critical mass. If you shutter your content marketing initiative a few months in, you may be missing out on the chance for amazing success. Seventy-seven percent of top performers agree that leadership gives ample time to produce results, while only 26% of least successful performers agree. Those who are committed enough to take time and see it through are the ones reaping the benefits. 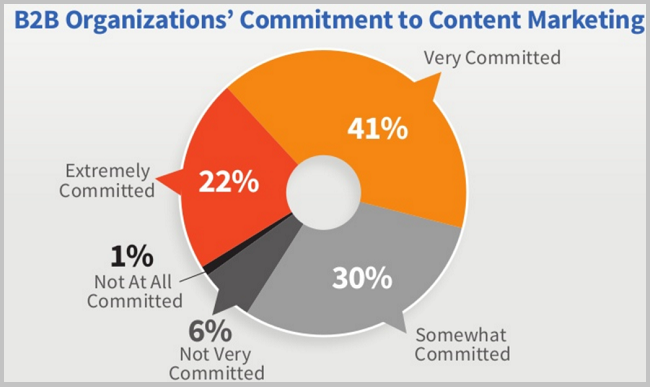 Commitment also requires dedicating enough resources to content marketing. Top performers spend 10% more on content marketing than the general population, and nearly 20% more than the least effective. How to Do It: If you want to truly succeed with content marketing, make it the focus of all your efforts. Integrate SEO into content. Use your paid channels to promote your top performing content. 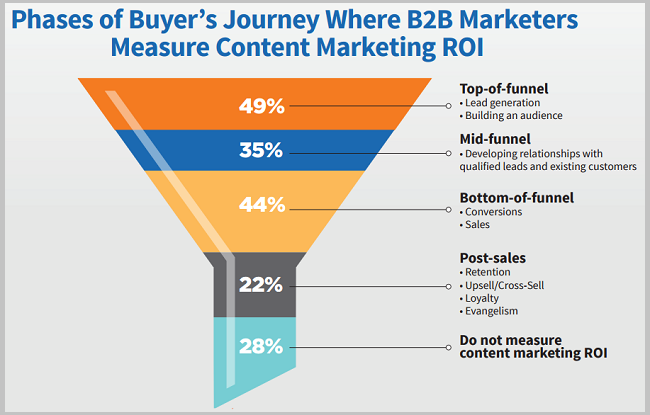 Use content at every stage of the buyer’s journey. 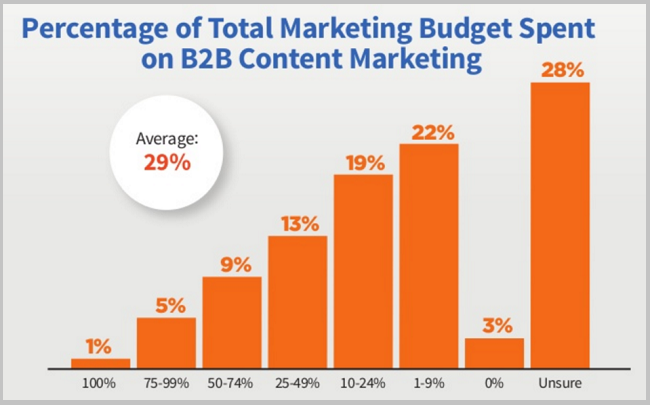 Commit to the budget you need to create and amplify content. And most importantly, commit to giving your efforts enough time to show results. This is one of the key elements of success, and the one that has the lowest level of adoption. Only 61% of top performers have it. Still, that’s nearly double the average of all responses. Most tellingly, 13% of the least successful have a documented strategy. Without a document to use as a guide, it’s nigh impossible to know what success looks like, make a commitment, and optimize over time. It’s like turning off your GPS while navigating in a strange city—you may eventually get to your destination, but not likely on purpose, and you may drive past it several times before you realize you’ve arrived. How to Do It: Get your team together and create a documented content marketing strategy. Spell out your goals and objectives. Identify your audience and brand voice. Plan your content types, topics, and channels of distribution. Build in measurement as well. You will likely change and optimize this plan over time—in fact, 87% of top performers say they can quickly adjust their strategy—but it’s crucial to have a documented starting point to unify and inform your efforts. When we interviewed Joe Pulizzi about his book, Content Inc., he impressed on us the importance of consistent publishing. It’s one of the key features of the Content Inc. model, based on the success of the Content Marketing Institute itself. The survey found that 85% of top performers publish content consistently, while only 58% of all respondents and 32% of the least effective did so. How to Do It: Your audience must know they will get fresh content at set intervals—that’s what compels them to keep coming back. Keep fulfilling that promise to your audience, and you can turn viewers into subscribers into customers. Note that the frequency of publication can vary depending on the audience—it could be daily, weekly, even biweekly—as long as it’s a consistent schedule. The final characteristic that sets top performers apart is the ability to quantify the success of their marketing in concrete terms. 88% of top performers can measure ROI, while only 56% of the least effective can. Marketers must get better at proving ROI, in order to speak the language of the C-suite, justify budgets, and demonstrate our value is anything but ephemeral and unquantifiable. How to Do It: Proving ROI is easier when you have a documented strategy in place with goals and metrics built in. With a little research, you can start assigning dollar values to marketing’s role in conversions. For example, if your average lead reads 4 pieces of content before converting, and the average sale is X dollars, the value of each piece of content could be seen as a percentage of X, after accounting for sales’ efforts. With proper attribution and the ability to see things from a dollars-and-cents mindset, we can prove the effectiveness of marketing to drive business. If your organization’s content marketing habits are closer to the “least effective” category than the “top performers,” it’s time to step up your game. As Joe says, it’s time to go “all in.” Make a commitment, draft a strategy, deliver consistently and properly attribute your actions. If you can do all of these things, your organization could be the object of envy in next year’s report. Hungry for more marketing stats? Check out our recap of HubSpot’s State of Inbound 2016.